Hi everyone, I hope you are all well and are enjoying your day. 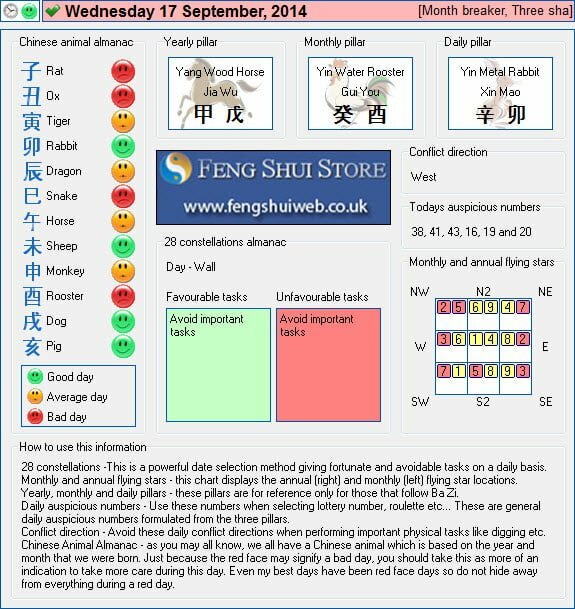 Here is the Free Feng Shui Tong Shu Almanac for Wednesday 17th September 2014. 28 constellations -This is a powerful date selection method giving fortunate and avoidable tasks on a daily basis. Monthly and annual flying stars – this chart displays the annual (right) and monthly (left) flying star locations. Yearly, monthly and daily pillars – these pillars are for reference only for those that follow Ba Zi. Daily auspicious numbers – Use these numbers when selecting lottery number, roulette etc… These are general daily auspicious numbers formulated from the three pillars. Conflict direction – Avoid these daily conflict directions when performing important physical tasks like digging etc. Chinese Animal Almanac – as you may all know, we all have a Chinese animal which is based on the year and month that we were born. Just because the red face may signify a bad day, you should take this as more of an indication to take more care during this day. Even my best days have been red face days so do not hide away from everything during a red day.